Villa Ste Therese is just 700 metres stroll from stunning Monpazier, an iconic Dordogne village, listed as "One of the Most Beautiful Villages of France". This Villa offers wonderful views & vistas from every terrace and bedroom window. Dive into the bustling weekly village markets, or simply laze by the large pool, or relax under a shady tree in the Villa's orchard. The Villa sits on four peaceful acres, so you feel completely immersed in the tranquil French countryside...with this beautiful active village right on your doorstep. Minutes from local attractions & major landmarks, ideal for families & groups. Two large upstairs double bedrooms can be converted to twin rooms, offering great flexibility. The kitchen is fully equipped to create any feast, with a large double oven and gas cook top. Each room is spaciously proportioned, with beautiful views over the rolling green valley to the south or the village to the west. The south terrace is a sunny breakfast spot, & the west terrace offers an ideal vantage point for sunset-watching or evening dining against the floodlit backdrop of Monpazier. Recent renovations have created a stylish, authentic, French country house offering all modern amenities. Canoeing, river beach & gabarre cruises: Limeuil, Bergerac, La Roque Gageac, Tremolat. The Village is a treasure itself....: Famous as the best-preserved bastide village in France, Monpazier may seem like a small, tranquil place, but it is a working village...which means a good choice of shops and restaurants for you! In fact the restaurants range from casual pizzerias, to family-run bistros, to elegant fine dining. There are two small supermarkets in the heart of the village, as well as an organic produce shop, two charcuteries, two patisseries, a boulangerie, a pharmacy, beauty salon with steamroom and masseuse, wine cellar & an ice-creamerie. Monpazier is the perfect village for browsing (and taking home an authentic local souvenir) as it offers a range of wonderful artisans galleries and showrooms. These include: an ostrich egg engraver, a ceramics showroom, a wood turner for bowls & decorative pieces, a traditional soap & perfume shop, a beautiful print & framing shop, a clockmaker, glassblower, artists' gallery and handmade leather goods. ...Or just relax around the Villa: The grounds of Villa Ste Therese were landscaped 50 years ago, in the French tradition of a gentleman's country house - hedging, shaped shrubs, established large deciduous trees, creating a vista in all shades of greens. A series of stone-walled terraces on the southern slopes lead down to the orchard below - a wonderful place to explore & enjoy...plums, figs, apples, peaches, walnuts, cherries. The northern lawn has plenty of room for petanque badminton or volleyball. Laze on a sun lounge on the terrace by the 10m x 5m pool, or retreat to the summer gazebo for midday shade. We love the fact that we can walk into the village in 5 minutes & relax with a coffee just to watch the world go by! Monpazier's accredited as 'One of the Most Beautiful Villages in France' so we never tire of its ancient beauty and gentle pace. The most recent Homeaway guest reviews can be viewed under the 'Owner Profile' section below ('About Rosemary V'). We are an Australian family who have all been bitten by the Travel Bug! We are also incurable, unabashed Francophiles. The Dordogne is emblematic of everything we love about 'la belle France'...atmospheric villages, amazing chateaux, wonderful wineries, millennia of history, not to mention the cuisine. Some of the most iconic food and wines are in this region...foie gras, truffles, confit duck, Bordeaux wines, cabecou goats cheese, Monbazillac wines...the list is endless! And we love it all! We have the best of both worlds at Villa Ste Therese - the peace and tranquility of four acres to enjoy, just a leisurely stroll to a lively active village, and location in an area overflowing with amazing ancient sights. At our place we can be as busy as we like, day-tripping all over this part of the Dordogne...or we can kick back and unwind at the Villa, never having to get into the car, as all we could need are at the house, or in the village on our doorstep. We felt instantly 'at home' with the Villa the first time we saw it - and the attachment grew when we stepped out onto the terrace to take in those beautiful views of Monpazier. And because we have both Villa and cottage on one site, it's the perfect base for our extended family & friends to gather. Nothing beats the stunning views of ancient Monpazier over sunset drinks on the terrace. Or for a change of scenery, laze by the pool and take in views of the beautiful French countryside in the valley below. Instant peace and contentment! All bathrooms have been completely refurbished, to offer bright, pristine facilities for guests. Four are large and spacious, while one is an ensuite shower-room, perfect for a single or couple, or for a person who cannot step in or out of bathtubs. Soft Egyptian cotton towels are provided in each bathroom. Pool towels are also provided. Heating included in rental fees during cooler months (mid October to mid May). Any heating requests outside this period incurs an extra heating charge. Local Michelin-awarded chef available to cater inhouse for your special occasions. Separate dining room. Dining tables on west terrace and south terrace. Barbeque set up on kitchen terrace. Pool opens from approx 1 June to 30 September each year, weather permitting. Children must be 5yo+, for safety reasons. Children over the age of five are welcome. For safety reasons we do not accept bookings with younger children. The pool is alarmed but not fenced, about 30 metres from the Villa. There are also steep stone terraces on the southern slopes, which could be dangerous falling-off points for toddlers. There are also no stair gates inside the Villa. The ground floor bedrooms may be suitable for elderly or infirm, as all main facilities are spaciously laid out. Sorry, no smoking and no pets allowed. The old gatekeeper's cottage on the northern boundary of the property, Les Cerisiers (Prop #908380), is set about 70 metres apart from the Villa, separated by large trees & hedges, offering a cosy couple's retreat. This may also be rented during your stay. Trying to find an affordable house to rent for 9 people (5 bedrooms and 5 bathrooms) that is beautiful, convenient, and comfortable is a challenge. But Villa Ste Therese met all our criteria and more. What a wonderful place! First of all, I'd stay there again in a minute. The house itself has lots of charm and character while still being comfortable in a modern sense. The kitchen was just the right size for several people to work together preparing dinner. Speaking of food, Monpazier--the utterly charming village just a short walk from the house--offers great butchers; convenient general stores for veg, fruit, and coffee; tempting boulangeries-patisseries; and some really wonderful restaurants. Their market day was fabulous as well. Rosemary, the owner, gives great, detailed advice on restaurants, tourist sites, and just about anything else you could think to ask. And her representative/ property manager Maria is a gem! When we had a minor heating problem, she was there in a flash. She got the repair guys there quickly and while she waited (yes, she waited to deal with them personally) she insisted on building a fire for the group and finding a portable heater for my husband who was in bed with a cold. A group of 9 nine friends arrived at the Villa St. Therese, luggage in hand, exhausted, and were transported back in time with the beauty of the scenery and the elegance and charm of our home for the week. Each couple had its own bedroom and bath - how amazing. Clean, well appointed, and perfect for our stay. We loved the furnishings of the villa and enjoyed breakfasts, luncheons and dinners in the dining room or on the terrace watching the sunset over Monpazier and the magnificent greenery surrounding us. Everything we needed was there from the kitchen to the washing machine and dishwasher to the pool and fruit trees in bloom. Simply divine. The icing on the cake was the information Rosemary, the owner, provided us as to what to see and do in the area. We took full advantage of it and were never disappointed. Don't miss an opportunity to visit this enchanting French masterpiece for a dream come true! 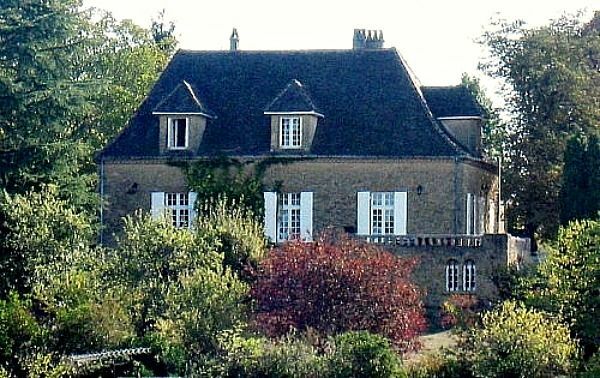 I stayed in this lovely house in Monpazier in the middle of September with a group of friends. The house itself is spacious and comfortable, and furnished very tastefully. Everything you could possibly need is provided, plus more. There are lots of spots around the beautifully maintained grounds where you can just sit, relax and enjoy the views. The terrace is an example of this, with its magnificent views across to the lovely bastide of Monpazier. The entire area is a paradise for food lovers. Delicious cheeses, foie gras, seasonal meats and fresh vegetables, and the delicious offerings of the various local markets in nearby villages. The bakeries were fabulous! After my stay I went on to visit other parts of Europe. But Villa Ste Therese in Monpazier was the absolute highlight of my trip. It's not often that photographs underestimate the glory of a spot, but when we arrived at this charming country house we were indeed more than delighted by the scale of the house, the beautiful and very large grounds, the ample space behind those charming French shutters and the attention to each and every detail. Of particular note to me is that as if often not the case in vacation homes, this house is as lovely to spend time indoors, as out. All is comfort, breathtaking views and easy chairs so that if one is inside one does not feel in any way robbed of the spectacular fields and French delicacies of the surrounds. Better yet, the little town is a gem and true to the description a short stroll away which makes for easy access and ready entertainment should one require the delights of the local restaurants, patisseries and market. Our landlady was available for any and all queries over and beyond domestic issues, providing us with an insider's knowledge that expanded our enjoyment far beyond the pages of the tour guides. The house served us well as a large group, ages from 12 to 82 and strong personalities amongst the crowd, but we came away each and every one of us hoping fervently to return. My wife and I joined friends for a week at Villa Ste Therese in September and had a wonderful time. We stayed in main house. The property, the location, and atmosphere are perfect for an introduction to this region in the south of France. The house is located on a hillside just outside of the village of Monpazier and is exactly as described on the rental site. The bedrooms are large and spacious and the ensuite bathroom had plenty of room. Although old, the house was very clean and well maintained. The kitchen was well stocked and the appliances were all new and in good working order. The dining room table could easily accommodate a dozen people, but most nights we ate outside on the patio overlooking the medieval village. The terraced grounds are pretty and include several fruit trees. I didn't make it into the pool for a dip, but it was in a sunny location and clean. The view from our bedroom was beautiful. The property is surrounded by farmland and the setting was truly relaxing. Each morning we could hear the neighbor's rooster crow in the distance and could see dairy cattle grazing in the adjacent fields. September is particularly pleasant because the days were warm and the nights cool (as we say "perfect sleeping weather"). Coming from Washington, DC, we were amazed each night at how quiet the house and countryside was. Villa Ste Therese is an easy place to let go of the cares of the rest of the world. The town of Monpazier was thoroughly charming. Only a ten minute walk down the road from the house, the town has several nice restaurants, with plenty of shops and bakeries. There were also a number of artists galleries and a glass blowing studio. Monpazier is steeped in medieval history and is remarkably well preserved. It is a wonderful base of operations for exploring the rest of the Dordogne which includes castles, prehistoric cave art, country towns, and great restaurants everywhere you turn. There were plenty of things to do within an hour's drive of Monpazier. The Dordogne River itself is beautiful and there are many places where you can stop for a view or reach the water (and even rent a canoe or kayak for a paddle through gorgeous country). Although close to Bordeaux and the world famous St. Emilion appellation, this area of the Dordogne is not well known for its wines. We would heartily recommend this property and we plan to return. Great spot for several couples, a group of friends, or a large family vacation. My wife and I stayed at this property in Sept. 2011 and had a lovely time. The main house is large and would work well for an extended family or group. Each room was pleasant, spacious and clean. The house and grounds have a lot of character and are well maintained. The cottage is more appropriate for a couple and is quaint and quiet, set apart from the main house. The property sits above a beautiful valley just outside of town. We woke to the sounds of farm animals in the morning and had a delightful view from our bedroom window. The house has a comfortable living room and large dining room, but we found it irressitible to eat at tables set outside where you can enjoy views in three directions. We enjoyed several delightful evenings on the patio watching the sun set over the stone walls of the nearby town. The weather was great well into late September. Monpazier is a real treat. The town has maintained its medieval character and is a wonderful place to stroll and explore. There are several shops and restaurants, all worth a repeat visit. The local bakery was a dependable supplier of bread and pastries, and we got in the habit of making daily trips. It is an easy ten minute walk from the house to town and it is not necessary to drive. Older children could safely make the walk on their own and have plenty to see and do. In season, the town has a farmers market with an array of vendors, produce, jams, and wines. It is definitely worth planning your week to see it. Although there are lots of fun things to do within an hour's drive, Monpazier is the perfect place to spend a quiet week without the need to jump in the car. Villa Ste Therese is absolutely lovely and we highly recommend it. My wife and I hope that we can make a return visit and would plan any future trip to France with this as one of our destinations. Dordogne is renowned for its cuisine, iconic wineries, chateaux & rich history. Yet it is still such a peaceful setting for a relaxing holiday. It's the Land of 1001 Chateaux as at every bend is another stunning vista of an ancient chateau; many are open for public visits. This area of the southern Dordogne is full of amazing medieval bastide villages, many of them with the title 'One of the Most Beautiful Villages of France', such as Monpazier, La Roque Gageac, Beynac, Domme, Sarlat, Belves. Gorgeous gardens are closeby, like Marqueyssac & Eyrignac. And for foodlovers, several Michelin-recommended restaurants are right on your doorstep. The climate is holiday-perfect most of the year, with sunny Spring days from April, then hot summer weather, perfect for lazing by the pool. Autumn is mild, mellow & tranquil, with rich golden colors in the surrounding oak forests...another ideal time to visit. Winter brings the beautiful Christmas markets and truffle fairs...lots of fun! Other Activities: Canoeing & kayaking along the tranquil Dordogne about 30 minutes drive north, or enjoy the more genteel pace of a one hour gabarre ride on the river - departing from either La Roque Gageac or Bergerac. Visit stunning underground caves at Les Grottes de Maxange at Le Buisson or Gouffre de Proumeyssac near Le Bugue or Font-de-Gaume at Les Eyzies. For kids there's go-karting and waterslides in Bergerac or a treetop adventure park in nearby Lacapelle Biron. Bookings commence 5pm on Saturdays and end at 10am on Saturdays. We cannot offer midweek departure days in summer months, sorry - changeover day is strictly Saturdays (we can be more flexible is quieter months). Rental fee includes end-of-stay cleaning, bed linen, bathroom & pool towels in summer (any extra cleaning or linen requests will be charged separately), local taxes. Pool is for exclusive use of Villa guests, in summer season: 1 June to end Sept (weather permitting). Children must be 5yo+ due to pool safety reasons. Heating fee included start October - end April. Heating requests at other times incur an extra charge of 80 euros per week. Non smoking; no pets. If guests cancel up to 60 days prior, booking deposit is retained. If guests cancel within 60 days of arrival, full tariff is non refundable. The small gatekeepers cottage, Les Cerisiers (sleeps 2), can also be rented separately to Villa. It sits on the northern property boundary, about 70 metres from the Villa, totally separate to main house.